Kikōdō (暿光堂) was a Japanese distributor based in Nihonbashi, Tokyo, which was already active in 1932. In 1934, the company asked Umemoto Kinzaburō (梅本金三郎) to set up a camera plant, that would become Umemoto Seisakusho, founded in 1935. It sold the cameras made by Umemoto until the war. 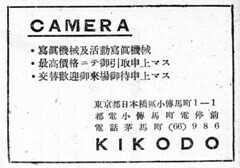 Kikōdō distributed other cameras as well: in 1935 it was selling Super, Kinka and Peter cameras. It was probably the owner of the brand "Super". In 1939 it was using a KIKODO TOKYO logo. Kikōdō survived the war but it became a retailer only and ceased to distribute cameras under its own brand. ↑ Its address in 1932 was Nihonbashi-ku Honshirogane-chō (日本橋区本銀町) 3–3; from 1935 to 1946 it was Nihonbashi-ku Kodenma-chō (日本橋区小伝馬町) 1–1. Source: advertisements in Asahi Camera June 1932 (p.A41), in Ars Camera July 1946 (p.3), and advertisements dated December 1935 to March 1941 reproduced in Kokusan kamera no rekishi, pp.74–5 and 94. ↑ Advertisement dated December 1935 reproduced in Kokusan kamera no rekishi, p.74. ↑ Advertisement dated February 1939 reproduced in Kokusan kamera no rekishi, pp.74–5. ↑ Private communication to User:Rebollo_fr by Umemoto Akio of Umemoto Seisakusho. ↑ Advertisement dated April 1937 for the Super Makinet Six, reproduced in Kokusan kamera no rekishi, p.94. Ars Camera. Advertisement by Kikōdō in July 1946 (p.3). Asahi Camera. Advertisement by Kikōdō in June 1932 (p.A41). This page was last edited on 22 January 2019, at 19:02.